Sarah Taylor Silverwood, LPAP artist in residence, began her ‘Longbridge Mass Observation’ project through observing and recording the everyday comings and goings of Longbridge. Drawings, texts, songs and other pieces of information recorded by both Sarah and a diverse range of local residents now make up what might be called a living archive of and for Longbridge. While Sarah’s project is a snapshot of this moment in time, ‘Longbridge Mass Observation’ directly references Mass Observation (MO), a social research organisation established in Britain in the 1930s. The organisation carried out a pioneering study of the everyday lives of people using original techniques and collected data via categories such as ‘the private lives of midwives’ and ‘shouts and gestures of motorists’. Its recorders were ordinary citizens who volunteered, empowered by the permission to study and sometimes be critical of their own communities. The study was democratic. Its inherent subjectivity made the data highly valuable but it was inconsistent and difficult to analyse. Sarah was interested in this aspect of MO, so aimed to focus on the importance of process and collaboration rather than creating something that could be used for data mining. Sarah has taken a number of key themes from the original MO and has developed a blueprint for data collection in Longbridge in the shape of a paper worksheet on which people can collect personal observations across twenty-four categories. These include ‘cooking’, ‘fearing’, ‘working’, ‘politics’ and ‘happiness’ which have elicited a range of fascinating and creative responses. She has utilised a variety of other data collection methodologies, gathering opinions, reflections, ideas and facts from members of the public, Turves Green Girls’ School pupils, users of Frankley Plus Children’s Centre and students from Longbridge College among others. These have been facilitated by questions and invitations positioned in newspapers, on beer mats, on social media, on portable wooden structures at Longbridge Light Festival, other community events and a host of other sites. One day diary entries have been produced with young people and children in particular, opening out possibilities for considering the personal experience of recording thoughts with pen and paper for community members more familiar with digital correspondence. These methodologies have been means to begin conversations about Longbridge with its own residents. 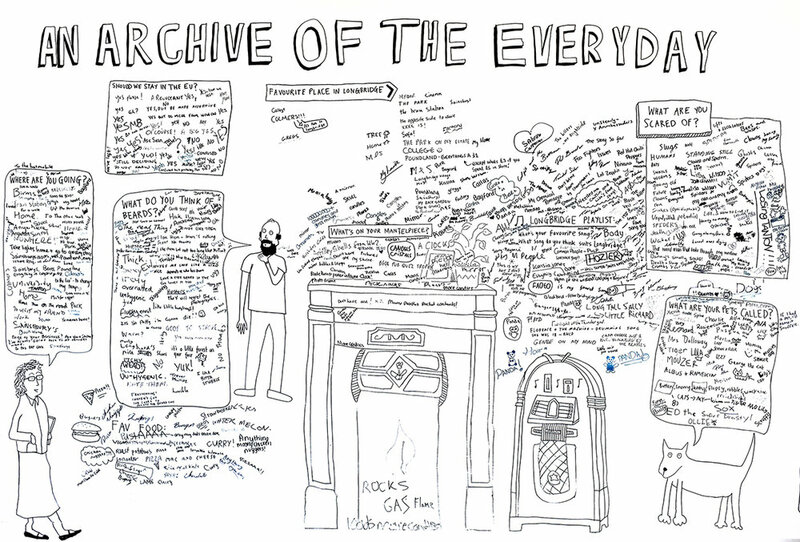 The project, developed from an initial micro-residency last summer, has since gathered incredible momentum and has grown into what Sarah describes as an expanded archive. It is currently available to access publicly both online at LMO2016.tumblr.com and via a temporary exhibition in the LPAP | Space. The physical exhibition comprises six black archive boxes of the collected documents, an index and a live soundtrack of songs that visitors can customise by selecting their favourite record, digital file, CD or cassette tape to play to activate the archive of music. 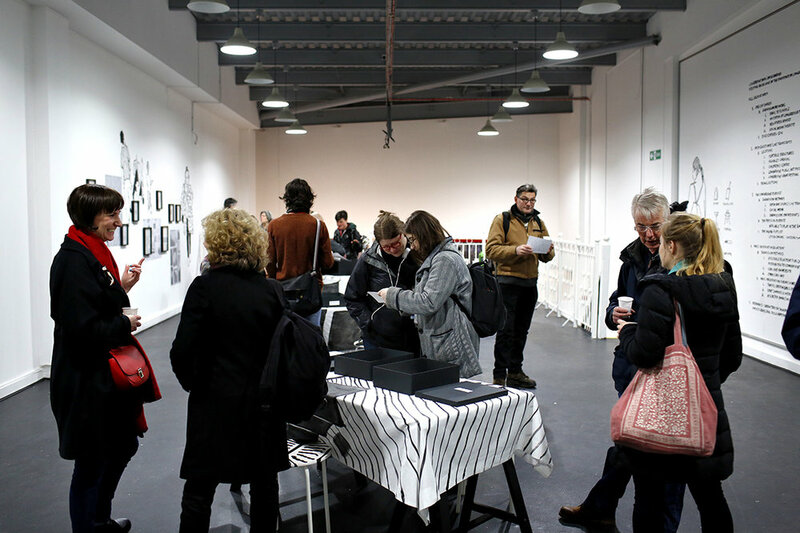 These elements of the archive are accompanied by stools and tablecloths that display the symbols used as starting points for the categorisation of information, a series of small framed drawings of people in Longbridge by made by Sarah and larger wall drawings of pedestrians that return the subjects almost to their original human-scale. The exhibition is marked by Sarah’s distinctive, clean and precise drawing aesthetic, using her handwriting as well as printed texts to pull out key aspects of the project’s development and outcomes. ‘Longbridge Mass Observation’ considers what Longbridge might be at this present moment.